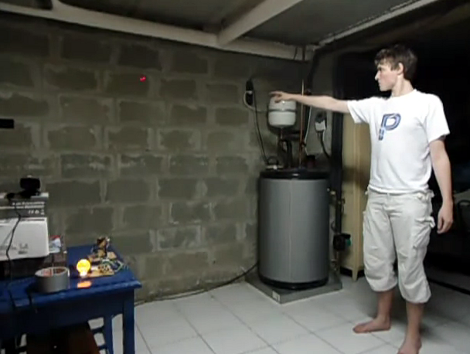 This home automation project lets you flap your arms to turn things on and off. [Toon] and [Jiang] have been working on the concept as part of their Master’s thesis at University. It uses a 3D camera with some custom software to pick up your gestures. What we really like is the laser pointer which provides feedback. You can see a red dot on the wall which followers where ever he points. Each controllable device has a special area to which the dot will snap when the user is pointing close to it. By raising his other arm the selected object can be turned on or off. Take a look at the two videos after the break to get a good overview of the concept. We’d love to see some type of laser projector used instead of just a single dot. This way you could have a pop-up menu system. Imagine getting a virtual remote control on the wall for skipping to the next audio track, adjusting the volume, or changing the TV channel. 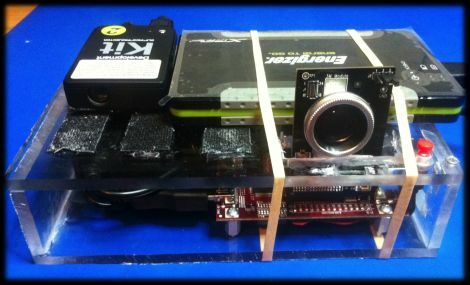 [Steven] needed to come up with a project for the Computer Vision course he was taking, so he decided to try building a portable 3D camera. His goal was to build a Kinect-like 3D scanner, though his solution is better suited for very detailed still scenes, while the Kinect performs shallow, less detailed scans of dynamic scenes. The device uses a TI DLP Pico projector for displaying the structured light patterns, while a cheap VGA camera is tasked with taking snapshots of the scene he is capturing. The data is fed into a Beagleboard, where OpenCV is used to create point clouds of the objects he is scanning. That data is then handed off to Meshlab, where the point clouds can be combined and tweaked to create the final 3D image. As [Steven] points out, the resultant images are pretty impressive considering his rig is completely portable and that it only uses an HVGA projector with a VGA camera. He says that someone using higher resolution equipment would certainly be able to generate fantastically detailed 3D images with ease. Be sure to check out his page for more details on the project, as well as links to the code he uses to put these images together.